Find out everything you need to know on the new Mercedes-Benz Cla Class from independent vehicle review website Car And Driving. You can watch the video review to the left to see more of the car or read their written review below to get a true insight from an expert in the automotive industry. 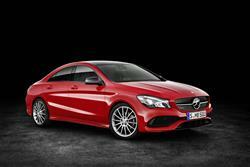 The four-door coupe-like CLA model has injected an extra dose of style into Mercedes' compact car model line-up. Jonathan Crouch reports on the revised version. The CLA has proved to be a rather different kind of Mercedes. It's compact and coupe-like, yet has four doors and a large boot. And it'll set the neighbours talking far more than if you simply bought yet another small German-badged executive saloon. It's a model to challenge your preconceptions, that's for sure. Now both four-door and 'Shooting Brake' estate variants have been lightly facelifted and made more efficient. Never underestimate the power of emotional appeal. It's brought us cars like this one, the Mercedes CLA, a stylish range of compact saloon and estate models that have brought a fashionable feel to the Stuttgart brand's growing family of smaller cars. To fully understand this design, now improved with a package of facelift updates, you need to be familiar with the so-called 'four-door coupe' concept, pioneered by Mercedes back in 2004 with their CLS-Class model, the first example of this kind of car and a trendier alternative to their similarly-sized but much more conventional E-Class saloon. The CLS was a huge success - to the point where it seemed only a matter of time before this prestigious German brand extended the concept to offer the same kind of car as an alternative to its smaller, more affordable C-Class saloon. In the Spring of 2013, Mercedes did just that, first launching the CLA in four-door form and following that up a year later with the introduction of a 'Shooting Brake' estate version. Want a CLA? Then you'll be someone who likes the idea of buying a sporty, prestigiously-badged compact model but wants to make a bit more of a statement about doing it. Mercedes markets this car as a 'sporty' alternative to its more conventional C-Class range. The CLA's sporty styling leads you to expect that. Though this car shares its chassis, steering and braking architecture with A and B-Class models, it does get its own suspension set-up, with various changes made to improve comfort and make it a bit less crashy over poorer surfaces. There's torque vectoring to help with the handling and 'Direct Steering' to sharpen things up at the helm (though it's still vaguer than we would like). At the top of the range is a fire-breathing CLA 45 AMG model with an uprated 381bhp turbo petrol 2.0-litre engine and a four-wheel drive layout - quite a car. More conventional CLA models are powered by engines borrowed from A and B-Class models. Diesel drivers get a 1.5-litre engine used with either 109 or 136bhp in the CLA 180d or CLA 200d variants. We tried the 2.1-litre 177bhp diesel unit offered in the CLA 220d. Petrol people get a 1.6-litre turbo unit offered in 122 or 156bhp guises in the CLA 180 and CLA 200 variants - or there's a 2.0-litre 184bhp powerplant in the CLA 220 4MATIC 4WD model that only comes with 7-speed 7G-DCT automatic transmission. This same 2.0-litre unit comes in a 211bhp state of tune in the CLA 250 variant that can also be ordered with 4WD. By any measure, this is a handsome car. Purposeful, with sporting proportions and a potent bonnet powerdome. Hi-tech too, with jewel-like LED daytime running lamps fashioned to create a flare effect around the smarter black-trimmed diamond-shaped grille that now sits below restyled bumpers on this revised model. It's not just about aesthetics either. The super-sleek drag factor of just 0.23Cd makes this not only the most aerodynamic Mercedes model to date but also one of the most aerodynamic production vehicles in the world. The cabin's virtually identical to that of an A-Class - which these days is a very good thing indeed. So you get the same deeply-cowled twin-dial instrument binnacle viewed through a lovely, grippy nappa leather-trimmed three-spoke multi-function steering wheel. There are the same five chrome-trimmed SLS supercar-style air vents decorating the dash. And you get the same iPad-style 5.8-inch free-standing infotainment screen stuck in the middle of it, this one now slimmer, with a smarter cover. The display is controlled by a little rotary dial positioned where the handbrake would normally be if it hadn't been replaced by one of those fiddly electronic ones with a switch hidden away beneath the dash. This revised model gets some upgraded trimming materials As for back seat accommodation, well any car that describes itself as a 'four-door coupe' clearly isn't going to have this as a top priority and it is a bit cramped. Ultimately though, I don't think this'll be a deal-breaker for many buyers. Particularly as boot room is so spacious. There's quite a high lip to lump your packages over, but once you do, there's a generous 470-litres on offer and a standard split-folding rear bench. If that's not enough, talk to your dealer about the CLA-Class Shooting Brake estate. Let's start with the facts. Expect to pay somewhere in the £25,000 to £30,000 bracket for mainstream petrol and diesel versions of this CLA-Class. We're going to focus here on the two models that will account for the majority of sales, the manual-only 122bhp CLA 180 petrol variant and the automatic-only 177bhp CLA 220d diesel. There's a £5,000 premium to go from one to the other. In each case, there's a choice of two different trim levels, entry-level 'Sport' and, for another £2,200, 'AMG Sport'. Talking of AMG, that only leaves the flagship CLA 45 AMG sports saloon variant - a different proposition entirely, priced towards the £45,000 mark. As for equipment, well even on base Sport models, the standard kit tally includes 18" alloy wheels, auto headlamps, heated power mirrors, air conditioning, a nappa leather-trimmed multi-function steering wheel, sports seats, a trip computer, Hill-Start Assist on manual models to stop you drifting backwards on uphill junctions and a decent quality six-speaker audio system with a 5.8-inch tablet-style display screen, aux-in and USB points and Bluetooth compatibility for your 'phone. There's even an Active Park Assist system that will identify potential spaces then, if you want, automatically steer the car into them. You'd expect one of the world's most aerodynamic production cars to deliver an ultra-competitive set of running costs, especially given that all the engines on offer feature direct injection and turbocharging, plus an ECO start/stop system that cuts the engine when you don't need it, stuck in traffic or waiting at the lights. Further efficiency measures include an economy setting for the automatic gearbox, intelligent management of engine ancillaries like the alternator, the oil feed and the water pump, a display to encourage more economical driving, low rolling resistance tyres, an adjustable radiator shutter and a CAMTRONIC load management system for the petrol 1.6 that reduces throttling loses under partial load, this alone improving fuel consumption by up to 10%. As a result, the efficiency champion variant, the CLA 180d, puts out only 89g/km of CO2. Meanwhile, the entry-level manual gearbox CLA 180 can manage 56.5mpg on the combined fuel cycle with emissions of 117g/km. As for the CLA 220d model, well providing you use the 'Economy' mode on the 7G-DCT seven-speed auto gearbox, you should get somewhere close to Mercedes' quoted figures - 70.6mpg on the combined cycle and as little as 104g/km. What else? Well, both C180 and C220d variants post a BIK company car taxation rate of just 18%. And residuals will be strong, providing you don't go mad on the options list. Insurance groupings for the mainstream models start at 18 for the CLA 180. If you're in the market for a compact, prestigiously-badged saloon or estate and like the look of this one, then nothing I'm going to say here is likely to dissuade you away from CLA motoring. Unlike Mercedes, I think this car does have some direct rivals, but I'd agree that there is quite a lot that's unique about the way it looks. This design has really proved to be a breath of fresh air in what had become rather a staid market sector. Which is it'll continue to sell as intended - to people who never intended to drive a Mercedes. Younger folk who don't care about the abandonment of the rear wheel drive layout that was once considered conditional for a car of this type. They'll probably care just as little about the rear seat packaging compromises and the rather firm ride. They might not even mind the premium pricing. It's all about emotional appeal you see, as I said at the beginning. Going forward, the CLA has a massive role to play in the Mercedes model range, with huge appeal in growing markets like China. Here, it'll be more of a niche product that importantly, frees up the C-Class to be a bit bigger and more luxurious. The kind of car that'll redefine what this brand stands for in the eyes of many potential buyers. Exactly as it was meant to.